After all, a Facebook group is useless if it’s not full of engaged members who fit your target market. 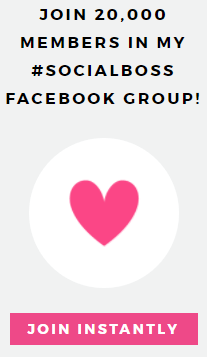 There are plenty of simple strategies to grow your Facebook group on autopilot. Strategies that’ll ensure your target market will consistently pour in on a daily basis. Out of the 2.13 billion people on Facebook as of December 31st, 2017 – over 1 billion now have Facebook groups. This is in large part because of the new features they introduced for Facebook group owners. As well as the undeniable benefits you reap by having a Facebook group. The benefits are endless if you play your cards right. Keep reading to discover the strategies that will help promote your Facebook group far and wide! 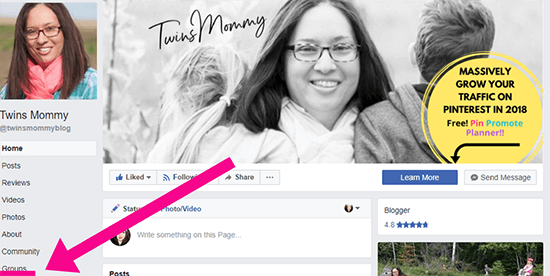 One of the easiest ways to lure loads of the right people to your Facebook group is by planting a link in your main navigation menu. These people are in all likelihood your exact target audience because they read your blog already. Making it likely they’ll jump at the chance to join your Facebook group. A genius strategy to gain new members on autopilot is to put your Facebook group link in your email signature. This way, every single email you send out will be an opportunity to gain a new member. As you can see from the examples, above and below – there are various creative ways to execute it. Both make it uncomplicated for people to join your group with the click of a button well you sleep! I’m sure it comes as no surprise that video content is taking the business world by storm. If content is king – video content surely is queen. A staggering 80% of all consumer internet traffic will be video content by 2020. Right now, over 500 million hours are being consumed on YouTube – each and every day. Making it the perfect platform to promote your growing Facebook group. How can you promote your Facebook group on YouTube? It’s imperative to never aimlessly add people to your group without their consent. It’s an intrusive method to gain new members that’ll annoy people before they have a chance to fall in love with your group. Think about it. How many Facebook groups have you been added too without giving your consent? It’s bothersome, isn’t it? You don’t want everybody in your group anyway. You want the right people. The ones who’ll devour your content, subscribe for your opt-in freebies, pay for your products or services, and become your loyal fans. If you want to grow your email list, gain blog traffic, and make more money using your new group – it’s wise to be choosy with who you allow into your group. How do you send a mass message? It’s the perfect alternative to adding people without their permission. You’ll begin to see people request to join your group and slowly gain traction. With 175 million active users roaming Pinterest every month, it’s become the go-to place for bloggers, marketers, and business owners alike. It only makes sense that you’d go to this marketing powerhouse when you’re attempting to promote your Facebook group. It’s one of the fastest ways to get content seen on the web, and it lasts much longer than posting on Facebook or Twitter. If you’re not utilizing Twitter to promote your content, products, and services – you’re majorly missing out. And the same goes for your Facebook group. Well over 500 million tweets go out every day, making it challenging to make your content stick around long enough to be seen. So what’s the point of attempting to promote your group on Twitter? The key to keeping eyes on a piece of content on Twitter is to “pin it” to the top of your feed. Create an eye-catching graphic, post it on Twitter, then “pin it” so it’ll be the first thing seen when someone stumbles upon your account. Your website is an outstanding place to advertise your new Facebook group. If you’ve created a Facebook group that is cohesive with your blog, then you already have a head start. The reason being: you’d have the same target audience for both your blog and your Facebook group. So any raving fans hanging around your blog will jump at the chance to become members of your new group on Facebook. Above are two striking examples of how different bloggers were able to add a link to their Facebook group in their sidebar. A top-notch strategy to get your Facebook group in front of more eyes is to mention it to every new subscriber who lands on your email list. When you carefully craft a welcome email or a welcome series for new subscribers, ensure to invite them to join your Facebook group. Triggered emails have a 70.5% higher open rate than your conventional emails, and a whopping 152% higher click-through rate. So the chances that a large percentage of your email list will see your link to your Facebook group are staggeringly high if you opt for the ever-so-popular welcome email series. Plus, you know they already enjoy your content – so most of those subscribers will be the perfect candidate for your group. You’ll also want to drop the link in every newsletter or email you send. While it doesn’t have the same high open rates – it can still an effective tactic to grow your new group. The use of Facebook business pages has become almost obsolete, because of the massive decline in organic reach. It’s still beneficial for your business to have a Facebook page for multiple reasons – but the days of seeing surges of traffic directly from Facebook pages appear to be dead. However, they’ve proven to be an excellent way to promote Facebook groups – by linking your group to your Facebook page. 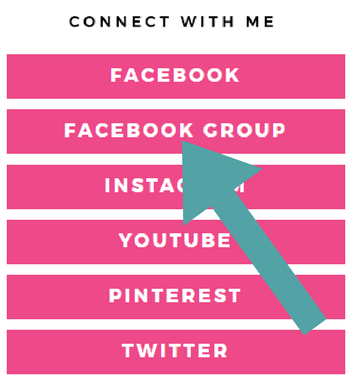 Once your audience clicks on that tab, they’ll have access to your Facebook group! 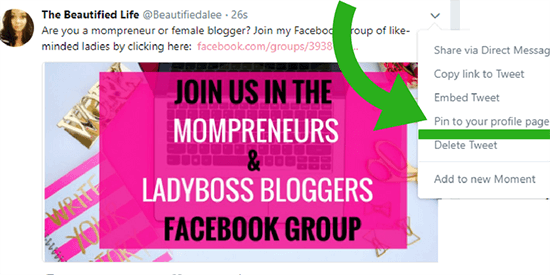 Most bloggers or business owners who utilize Facebook groups to grow their blog traffic see a huge chunk of their traffic from this Facebook groups. They’re powerful if you use them correctly. Almost every Facebook group has daily thread prompts. They’re a stellar way to get your group members engaged and keep them active. Some of them allow you to post any type of promotion you’d like on particular days. As long as you’re mindful to read each thread’s rules, you can start promoting your Facebook group this way. This works exceedingly well in groups that have a similar audience as yours. To captivate your target audience’s attention, write a sentence or two with the link. Something intriguing to pull them in. Something that tells them exactly why they should click “join group”. 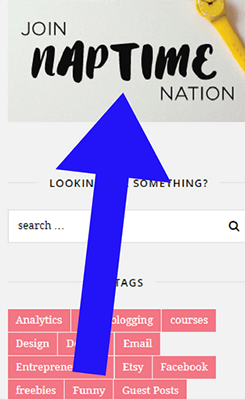 There are scads of places to sprinkle links going directly to your group, all over your website. We already talked about your top navigation menu and your sidebar, but we’re far from done! Your website is going to be your best bet for accumulating new group members, because your audience is already interested in your content. They’ll make the leap over to your new group without a second thought! As you can see, she’s used social proof to entice her audience over to her Facebook group. If you don’t have social proof yet, you can allure your visitors with the right copywriting and awe-inspiring graphics. You’ll also notice she uses ‘’Join Instantly” as her Call-to-Action. This spurs urgency, and it likely works well for converting new members to her Facebook group. If you have opt-in offers or paid products on your blog, then you certainly have “thank you” landing pages that appear after the visitor has put in their email address. “Thank you” pages are overlooked, to say the least. When someone has just given up the goods, aka, their email address – that means they probably already adore your content and your brand. The timing couldn’t be more perfect to ask them to join your Facebook group. During the hustle and bustle of running a business, it’s all too easy to forget one of the most clever ways to get your Facebook group noticed. Most Facebook group owners may post a stunning graphic on social media for the first week to advertise their group – but then it slowly dies out. And so do the conversion rates for their Facebook group. Setup a social media scheduling tool and use it to cross-promote your Facebook group on other social media platforms. Tools that offer the ability to recycle social media posts work the best way here. That way, your Facebook Group will be promoted on autopilot. Make it a regular part of your social media strategy, and it’ll pay off big-time. Pinterest group boards are marketing powerhouses – with the ability to reach thousands or even millions of people. 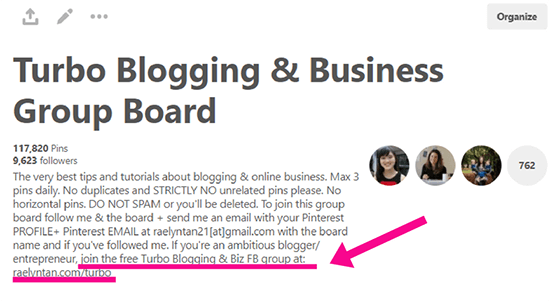 So it makes sense that almost every entrepreneur and blogger on Pinterest runs at least one group board. A common theme among these business owners is to place a link to their Facebook group at the end of the group board description. This is a brilliant move, since medium to large group boards see copious amounts of requests to join their boards on a daily basis. That’s a whole lot of eyes seeing her link. On Instagram, you’re only given one tiny spot to make a big first impression. One small area complete with one link. One link out of the 10 you probably have floating around in your head. However, in the beginning stages of growing your Facebook group, the smartest move you can make is to use that link for your Facebook group for as long as possible. This will allow you to grow your group on autopilot, like many of these strategies. You can always change it up later, or go in and change it to show your Facebook group only a few days per week if you have other links you’re dying to share. There’s no doubt that Facebook business pages aren’t as effective as they used to be unless you’re shelling out the dough. But they can still be beneficial in many ways – if you know how to use them. As for Facebook lives – you have an opportunity to promote your Facebook group in a long-lasting way. Sometimes you’ll see Facebook lives in your newsfeed a week after it’s been posted live. So when you create a Facebook live video on your Facebook page – you should always mention your group. Combine that with a link in the description of the video, and you’re golden. 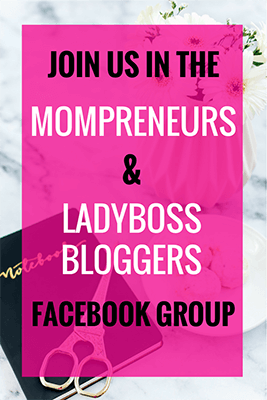 Starting a Facebook group may seem like an uphill battle, but I can assure you – it gets easier and it’s an excellent marketing tactic that can catapult your business. Especially when you have the right strategies, your group’s growth is on autopilot. You have the ability to build a thriving community full of raving and loyal fans. Fans that will be first in line for every paid product you have. They’ll show up for every webinar. And they’ll rave about your paid offerings, so you don’t have too, anymore. All in all, they’re a business owner’s dream.